2013 has been an up and down year for me (so far), but fishing more regularly meant that I was rattling through the fresh water species list. 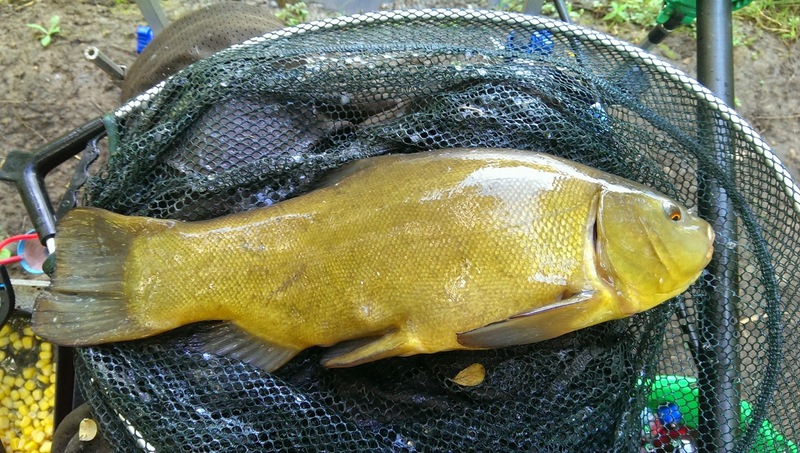 But one species that had evaded me so far was the Tench! I had thought that, given the current weather conditions and time of year, maybe my chances of catching one were coming close to an end. I knew of a venue which had produced well for me in the past and decided to give it a whirl (especially because if it produced it would be a venue I could take my father in law who has never caught a Tench), and the venue I had chosen to fish was the Reservoir Lake of Duffryn Springs. The Reservoir Lake is on the bottom left, and I would be fishing the southern corner. 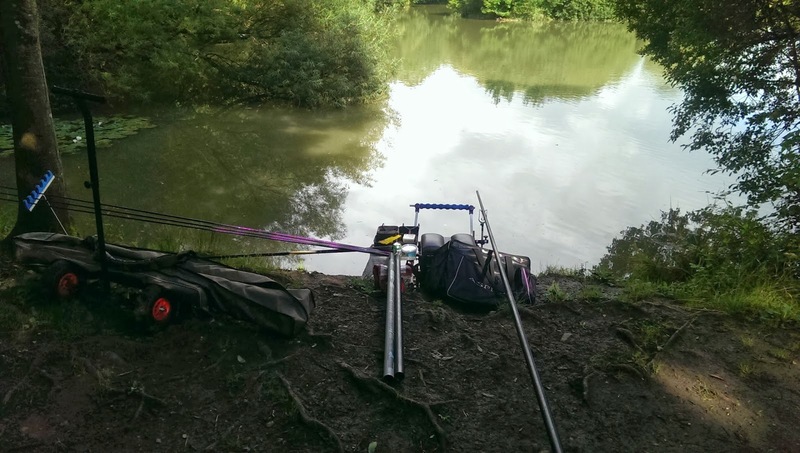 Duffryn Springs is a 4 lake complex which offers easy access fishing to anglers. Ther is also a small shop on site which offers toilet facilities and the opportunity for a cup of tea on those colder of days. The lake I had chosen to fish was the furthest away from the lodge and required a small drive to the nearest car park and then a walk of a further 200 yards. On paying at the lodge I was informed that I would be the only one fishing the Res lake (which meant my swim of choice would be free! ), and that all the lakes were producing quiet well. So I hopped back in the car and made my way down to lake. After a short walk, with the help of my trusty trolley, I was bank side, set up and raring to go. I had chosen a corner peg, which offered a lot of options. There were lilies to my left, an over-hanging tree out in front, and a reasonable amount of open water and a margin swim to the right. I started feeding the lily and tree swims with pellets and chose to start fishing on old faithful (double red maggot) in the open water to see what was lurking! Flicking out the maggots and shipping out to 6 meters, the float hadn’t even fully cocked when it sailed under. The roach were taking on the drop, and the first fish of the day found its way to bank, a perfect roach of a few ounces. Re baiting and dropping my rig and maggots in at my feet, I hadn’t shipped out more than my top three when my float vanished! Another roach, around the same size, and literally taking from under my feet! Rather than ship in and out repeatedly I sat for the best part of 25 minutes fishing an impromptu “whip” method on my top 3 and quickly lost count of the number of fish I caught. But they would take anything, maggots, casters, corn, tiny slithers of meat. I couldn’t get through them, at least not this close to the bank anyway. Stepping up my gear, it was time to go after some better sport, this meant 14 elastic and 8mm banded pellets. Shipping out to the tree directly in front of me, I lowered in my pellet hookbait and began the waiting game. There was a lot of activity in the swim, and instantly I began having line bites. There were no stereotypical tench signs however (bubbles fizzing or vegetation movement) so I sat there hoping the roach hadn’t descended and were devouring the bed of pellets I had previously laid down. The line bites were becoming more aggressive and after another minute or two the float was gently pulled under and I was into a fish! 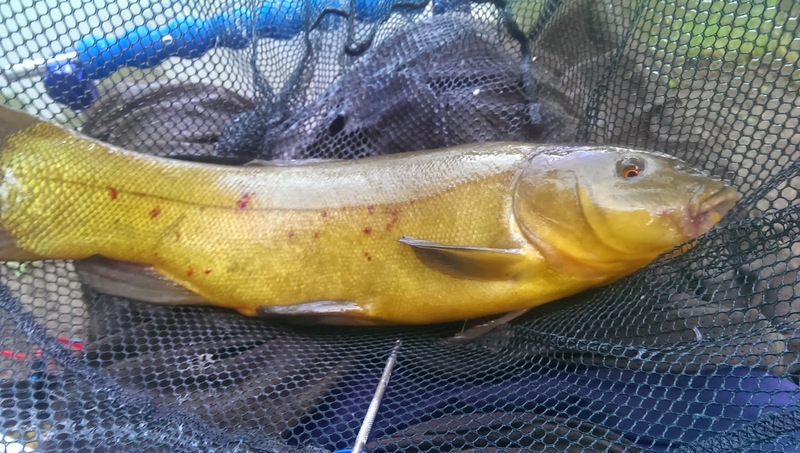 There is something about the way a Tench fights which means its capture is that little bit more satisfying than other species. They tend to stay deep and search for snags as long as they can before giving up, and even when you think you have beaten them they have a tendency to surge off! 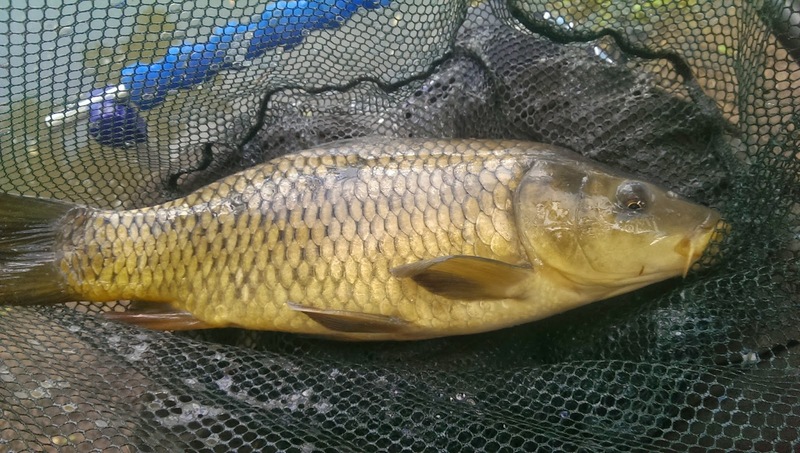 Although this little critter tried his best he ended up in the net, and I was sat on my box feeling proud as punch with my first Tench capture of 2013 – a fish of around 2 ½ lb. Re-baiting the swim with some more micro pellets, I shipped back out and hoped that this fish was going to be the start of many. The waiting between bites was around 5 minutes, but the line bites were instant. Occasionally the float would go completely stationary, but a quick readjust of the baits position ensured more bites. The float slunk away for the second time and my elastic disappeared under the water. 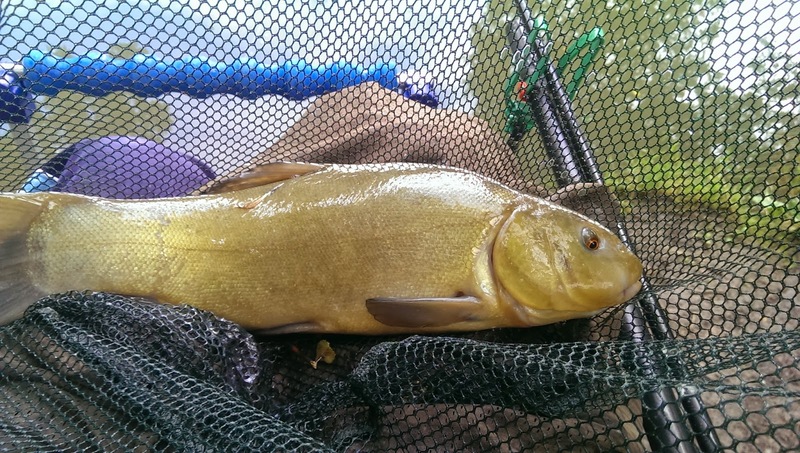 Another dogged fight could mean only one thing, the Tench were in and on the feed! This one was a slightly better size just tipping the 3lb mark. After 3 more Tench, the biggest of which was just over 4lb, I switched baits to try to bring out the bigger specimens that I knew the lake held. 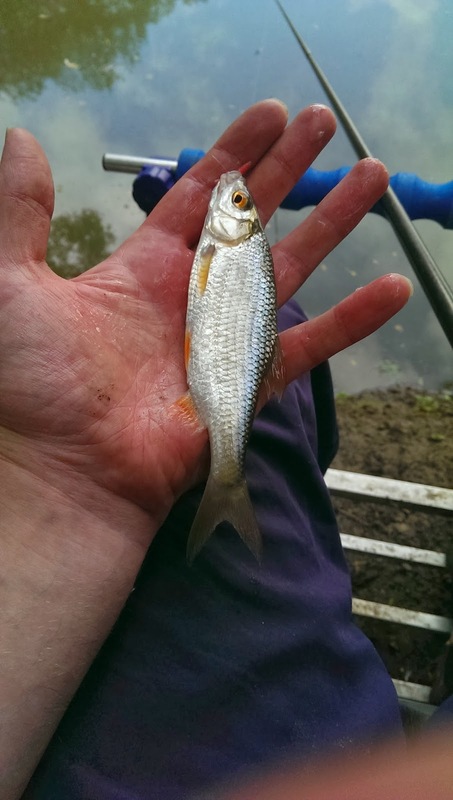 Despite changing baits to meat, sweetcorn and hook rings of maggots, I was consistently plagued by the smaller silver fish. Maybe it was time to switch swims. I fired out a few pouchfuls of Sonubaits Krill flavoured micro pellets and left the swim alone. Meanwhile I had shipped in, re-banded my pellets and shipped out to the lilies where I had also been feeding. The Tench at Duffryn Springs provide great sport! The line bites were just as instantaneous as before, but the actual bites came a lot quicker and much more aggressively. The elastic tore out of the pole and for a moment I thought “PB Tench?”. But on turning the fish, it decided to jump straight out of the water. 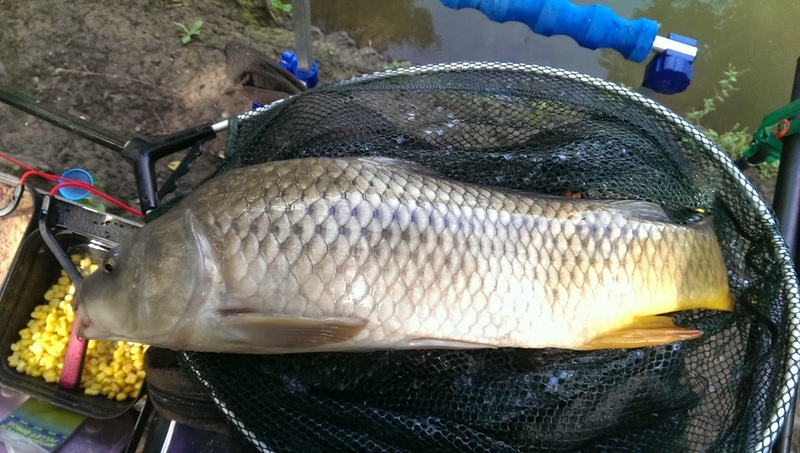 A Carp of around 4lbs splashed back into the water. I think that burst of energy tired the fish out because it sailed in, and was quickly unhooked before being carefully returned. Shipping back out towards the lilies I placed the pellet as close as I could without catching the foliage. This time the bite was the quintessential Tench bite. The “lift bite”. As Tench are bottom feeders, generally they will pick up your hookbait without knowing they have been hooked, then rise away from the bed of the lake causing your float to “lift”. Fishing so close to the lilies meant that my strike had to be more aggressive than it would be in open water, and on connecting with the fish I am glad I struck hard. A lovely fish (although I can’t explain the red dots) of well over 4 ½ lbs, which fought even after it had found its way into the landing net. On closer inspection I could see that the fish wasn’t bleeding. 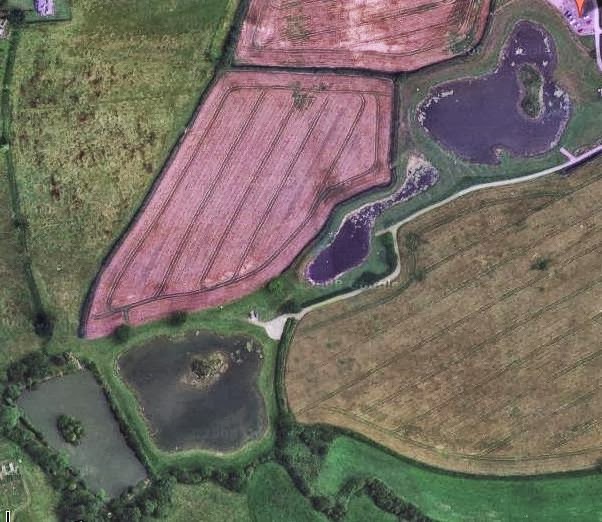 Someone has suggested that the red dots may indicate the fish was breeding. But all suggestions welcome! The next fish was a surprise. Fishing in the same location and still using pellets, the bites became very timid. On striking I hit into something large and lazy. Shipping in I had no idea what to expect, but didn’t even consider catching a slab! 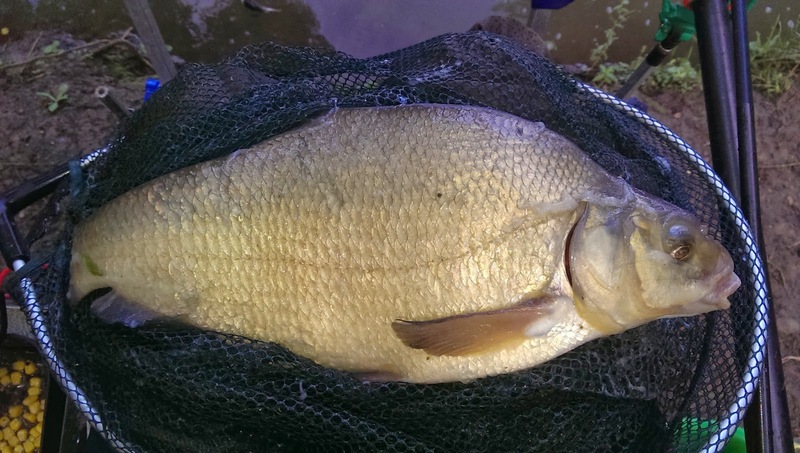 I lovely bream, well over 4lbs, and a real surprise! 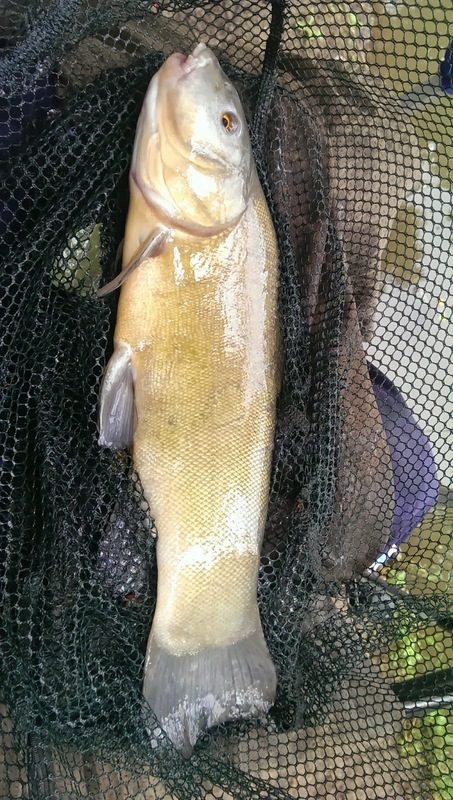 The tench were still very much on the feed and I managed to land another 6 before returning to my original swim. The swim was still incredibly active, although you couldn’t tell from the surface, and within seconds the float had gone. Striking, this was something better! 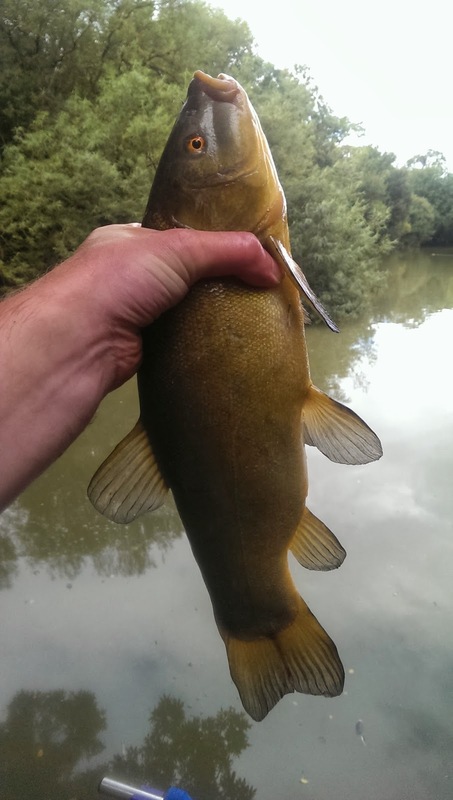 Again I started to think “PB Tench?” This was a tough fight and the fish was intent on getting caught up in snags. After 3 minutes of tug-of-war I brought the fish out from the lilies (where it had charged off too) and towards my net. Only breaking the surface did I see it wasn’t a Tench but a gutsy Carp of over 7lb. I stuck with this swim until the end of my session. Fishing from 10.30 until 3.30 and catching a total of 20 tench along with a heck of a lot of other species resulted in my leaving one very happy chappy. Duffryn Springs is a great fishery, and is worth looking up if you needed/want to catch a Tinca like I did! With 4 lakes to choose from and with easy access to 3 it is a great place to fish if walking is a bit difficult. I walked a few hundred meters to get to my desired lake, but that was easy enough, and I don’t doubt I would have had an equally enjoyable day on the other lakes had I decided to fish them instead. One thing I did find puzzling, on leaving the venue I started chatting to an angler who asked my how much I had paid to fish the bottom lake. I told him £8 (which I thought was a bit steep), to which he replied “I paid £5.50”. I was obviously a bit perplexed, but he then went on to tell me that the top lake (the first one you see on entering the complex) was £10 a day. The angler actually joked and said “he makes up the prices as he goes along”. I didn’t mind paying £8, but there was nothing in the lodge to justify the lakes variation in cost (like they do in Cefn Mably). Despite the discovering the difference in prices I left a very happy angler and will definitely be taking my father-in-law there to help him try and catch his first Tench. I would also recommend the other lakes as they are all filled with fish too. While leaving I saw 2 carp over 5lb’s being caught (on meat from the margins), and as they are cheaper they also offer a bit of a saving! I preferred the reservoir lake as it was more established (with a lot more wildlife) than the purpose built ponds that I walked past. Disabled Access *** ½ (The 3 lakes are very easy access, but unless you had someone to take you to the reservoir lake, it would be out of bounds to wheelchair users).